I go on and on about Google. via 5by5 | The Critical Path #110: The Profit Algorithm. Horace builds on his discussion of Google from the previous episode in light of the Nest acquisition news. We also look at the relatively unreported news regarding China lifting its 13-year ban on game consoles and the variables it introduces to a “big niche” industry. 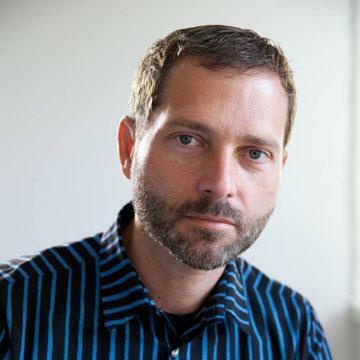 via 5by5 | The Critical Path #109: Google Ventures. On a recent podcast I noted that Google was perceived as invulnerable. In contrast, Apple is seen as temporarily enjoying a stay of execution.1 This is not necessarily a bad thing for Apple. The more gushing the loathing or scorn, the more likely it’s a reaction to love and attraction. A brand dies not from hate but from apathy. But nor is it necessarily a good thing for Google be be seen as invulnerable. There might be no “Google death knell counter”. There might not be a “Google is doomed” trope. If an executive from Google quits or is fired there is no investor panic. If a product is withdrawn there is no mourning. There are no journalists pursuing Pulitzer prizes by describing some seamy underside of Google. But there are no overt displays of affection either. Google is seen, on balance, as benevolent and hopeful. The discussion on business robustness is simply missing. Too complex, too pervasive. These are systems, not things. And people are not designed to contemplate systems. We leave that to experts, or better yet, computers. 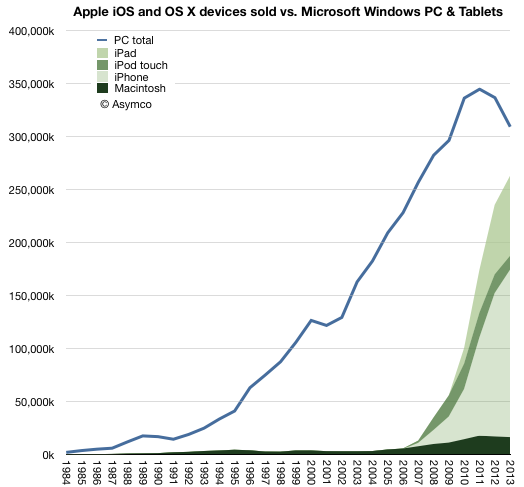 The reason Apple is contemplated at all is that it’s not seen as a system. Even the suggestion that Apple is a system is implicitly treated as an impossibility. Because it’s not a system it’s fragile. It’s a person, or an idea, or a product or a singular “key” to something. It is, ultimately, mortal. The only debate is when it will die and points are earned for calling it sooner rather than later. But Apple does not pursue profits either! In my essay on Google’s absence of profit (or income or business) motives questions were raised on the stated absence of hunger for profits from Apple and what difference there might be from Google’s philosophy. “Our goal isn’t to make money. Our goal absolutely at Apple is not to make money. It may sound a little flippant, but it’s the truth.”1. However, note that both quotes are qualified. In the case of Jobs, he said “not just to make money”. Jobs clearly stated that great products lead to money. That great products are causal to money and therefore that if you make great products you make money. One leads to the other. There is a difference between Apple’s “indifference to money” and the “indifference to business models” that Google exhibits. Google steps even further away from cash flows. Its goals are to build great things guided by their vision and patterns in the data they collect. The value is in the data itself rather than in any transaction. As long as the source of money is unfettered, its provenance is uninteresting. A business model is a profit algorithm. It could be linked to the data but it need not be. Markets are messy and imperfect. Data provides much clearer views into value. You could conclude that value itself cannot be trusted to the judgement of the public. Value is to be determined through the recognition of patterns on data privately collected. So when I say that Google has disdain for market mechanisms I mean that they believe they can do better. Apple still values the user as the ultimate adjudicator of its actions. Google looks past the user and interprets their intentions. Google sees markets as ultimately obsolete. A short anecdote about the history of Silicon Valley told at Asymconf California last year using techniques taught at Airshow workshop. Next workshop is in San Jose on Jan 30, 2014.
via The Birth of Silicon Valley — Airshow: World Tour. I arrived at these estimates without looking at anyone else’s (except for Apple’s own published guidance). Soon after sending them I noticed that Daniel Tello published his own. In the same format as above, I quote them for comparison. Please visit his post for additional detail. 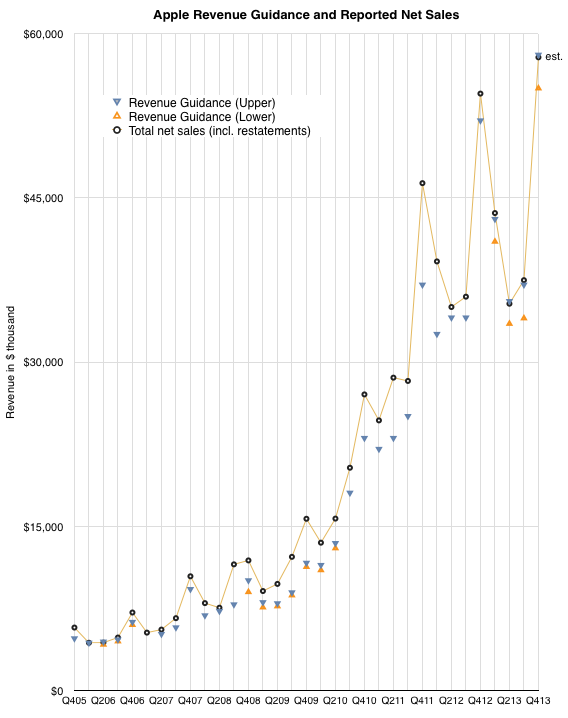 The graph below shows the history of revenue guidance vs. revenue reported. The last quarter shows my estimate for net sales. Note that the company achieved at or slightly above its upper guidance ever since they started offering a range for guidance (i.e. since Q1 2013). My estimate for sales is therefore very near the top of guidance. The figures for units earnings and margins all result from this assumption.